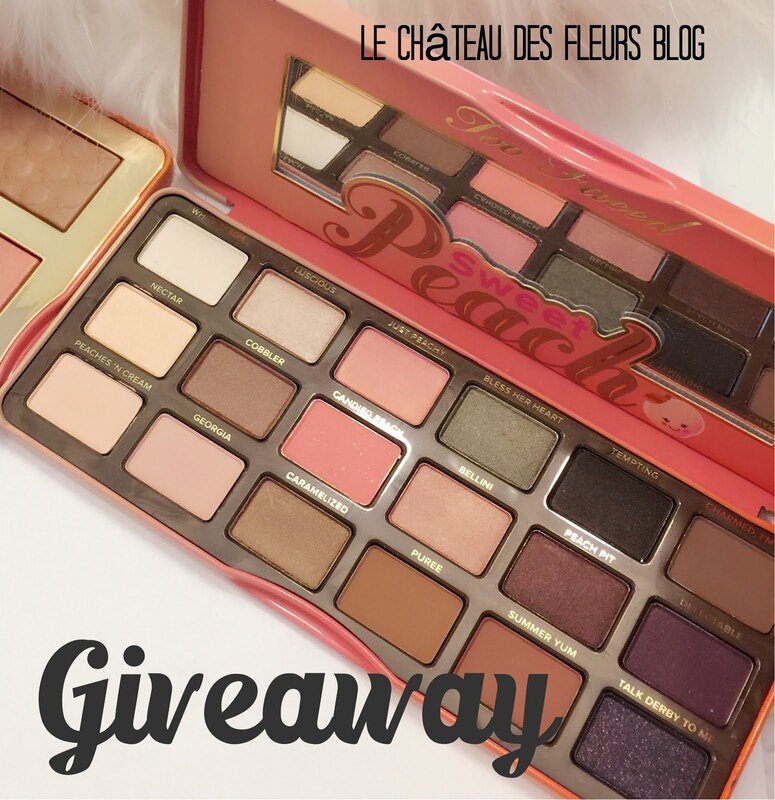 "Isabelle Thornton" Le Chateau des Fleurs: Day 2. Valentine countdown. Macarons de Paris recipe. Day 2. Valentine countdown. 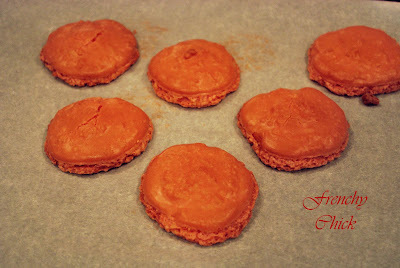 Macarons de Paris recipe. Macarons de Paris. Those are different than the Macaroons. You find them in Fine French bakeries. Now, you can make them...and they look so good. I like the strawberries, orange, chocolate, lemon, the best. You can also add cinnamon for a twist. SOOOOO GOOOD. 1 box Pure Almond paste (.7 OZ) or 1 cup Almond flour(lucky you if you find it here in States, tell me if you do...), in this case add 1/4 cup granulated sugar to dry ingredients. 1 1/4 cup Confectioner Powdered sugar. Keep the egg white at room temperature over night to tougher the eggs. Beat eggs with salt until picks form. Grate the Almond paste, add Powdered sugar and mix. Fold gently in egg bowl. Add extract and coloring. Here, i added Strawberry extract and red coloring. Put everything in piping bag, make circles on parchment paper. Try to do same shape for all. They all will look flat and small. With little chunks if using the paste. Smooth, using Flour. Let sit for 2 hours on counter. (This is how you get the cool ring on bottom of cookies. Cook for 15 minutes, then turn rack to cook evenly for 15 more, depending on cookies sizes. The cookies will fluff 5 times their sizes. Cook until done but not starting to brown. Keep a wooden spoon in oven door to keep it open during cooking. I added extract and coloring to my white store bought icing. I like the cookies better without icing though. 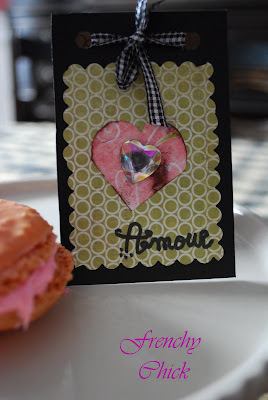 Another cute card with the same lay out as yesterday. The quote says..."I am my beloved, and my beloved is me." I am dazzled..these look super lovely and decadent! Love the photos..sweet and charming! Lovely recipe! Ooh, la, la! 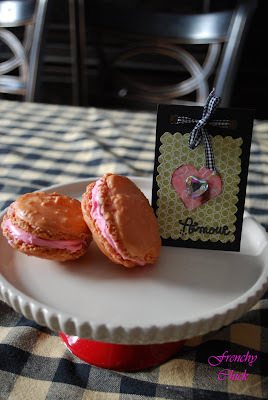 I confess I never knew that macarons existed until I started reading Paris Breakfasts blog. She adores them. So I just had to try some and got a variety assortment at a Paul's bakery and YUM! my faves were the pistachio, and lemon. Thank you for the recipe. Oh wow, these look amazing. May have to try the recipe! These look wonderful! Thanks for stopping by Tuesday Tastes! Very nice, and such pretty pictures! Mhhhhaam!Yesyesyesyesyesyes a thousand times; how much I love these, can't even express it in words.hahaha! I even sneaked some into my purse when I entered the airplane on my way home from Paris. No one noticed. Thankfully, so I could enjoy them on my way home too. Great recipe Frenchy, I might try it sometime soon. But I can't wait til summer to eat the original Parisian ones again. I've been reading about how to make these for a while. Lovely and yummy! MMMmmm...almond paste! How bad can they be, right? for around $8-$9 and I later saw it at Wal-Mart of all places for $9. The brand I found was "Bob's Red Mill"
Yummy! I've been looking at macaroons everywhere lately. Thanks for sharing the recipe! You have the cutest blog! So sassy! Just found you via My Romantic Home. I'm your newest follower and would be delighted to have you follow me back! How cute and pink! I love it! I'm hosting a Friday Food Fight. I would love for you to link up and play along. Wow I love your recipe--I posted my recipe on my blog awhile back--but these look way easier to make--and turned out lovely! Great job! I have seen them on other blogs but never a recipe. They look delicious. Look delightful and must be delicious! Have a pink new week ahead. I am really enjoying your site - it so much fun! You can find almond flour at Bob's Red Mill (I shop there online all the time); bobsredmill.com. A lot of health food stores carry them but I trust Bobs. I'm off to read more posts! Thanks for the recipe! 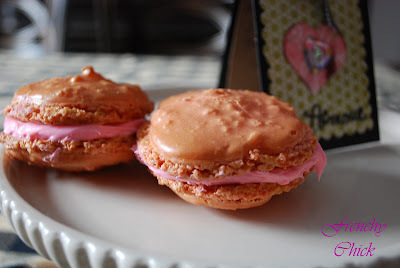 I am still working off my "macaron" weight gain from Paris in Nov.... Why not make some? !